Ask students how they might recreate the surface of a distant planet in preparation for a new community and you might get a few blank stares or wildly entertaining suggestions. Present them with a sandpit where they dig and a lake appears, flatten a forest with the sweep of a hand for a wide expanse of crop land, form high peaks that will collect a snowpack to see an otherwise drought-ridden populace through a sun baked spring and summer — and you’ll have a lot more discussion than just how. The “why” and perhaps even “should we” can really make a lesson take flight. Recently, Tellart’s Terraform table invited visitors to London’s V&A Museum to “play God” in just this way, thanks to projection mapping able to read the height of the sand to respond to changes. Educational experiences like this are entering the classroom; engaging students’s hands, critical minds and imaginations. Building an immersive experience through the use of virtual reality and projection doesn’t have to be complicated, or expensive. Students can dip a toe into VR, and the Nile, during Virtual Field Trips to ancient ruins, top rated museum exhibits and cultures from around the world. One school budget-friendly option is the Google Cardboard. These $15-or-less foldable cardboard masks turn your average omnipresent smart phone into the halls of the Vatican, sands of Egypt or Serengeti safari. HMH Field Trips (Houghton Mifflin Harcourt) are engaging 3D, 360° excursions powered by Google Expeditions which allow teachers to guide students in a truly immersive experience without ever leaving the classroom. 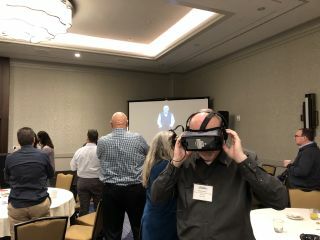 For many teachers, this is less about using tech such as VR headsets as a mainstay of classroom learning — in fact, some student might find the visuals disorienting so use should be kept to short periods. But as an engaging jumpstart to a new chapter in Social Studies, or an immersive step into the stars in Science, these kind of thrills can coexist happily with the content-driven lectures, lessons and traditional projects used for teaching. Interactivity in projection use has opened the classroom to a host of new options for group work. Bringing hand-drawn characters to life as live animated recreations of historical moments, little fingers following the flight of the Monarch on their annual migration, even theorizing Civil War battle paths and strategy with opposing armies doing the same keeps students of all ages tuned into the lessons. Each year, the tech improves and advances, bringing more opportunities to enhance our K-12 classrooms. At the University level, entire rooms of students join a single VR headset user through a combination of a 4K projector with two alternating visual fields for the illusion of depth, an 115sq ft ActiveWall space and an Advanced Realtime Tracking system. Observing and even participating in VR surgeries and heart transplants with nary a drop of patient blood sacrificed— these sort of real life incredible opportunities will soon be within reach, inspiring even the youngest little mind to dream big.